Computing, powered by computers, serves as the backbone of our information society. They act as the cornerstone to the Internet, desktops, mobile phones and countless other industries. Computers are arguably the most important invention of the last 50 years. Thinking Exponentially, almost everyone under estimates the implications of computing technology. Each generation of computers stands on the shoulders of the previous generation. Hence, if a computer doubles in power 3 times, it’s not just 3 times faster, its 8 times faster (2 * 2 * 2). 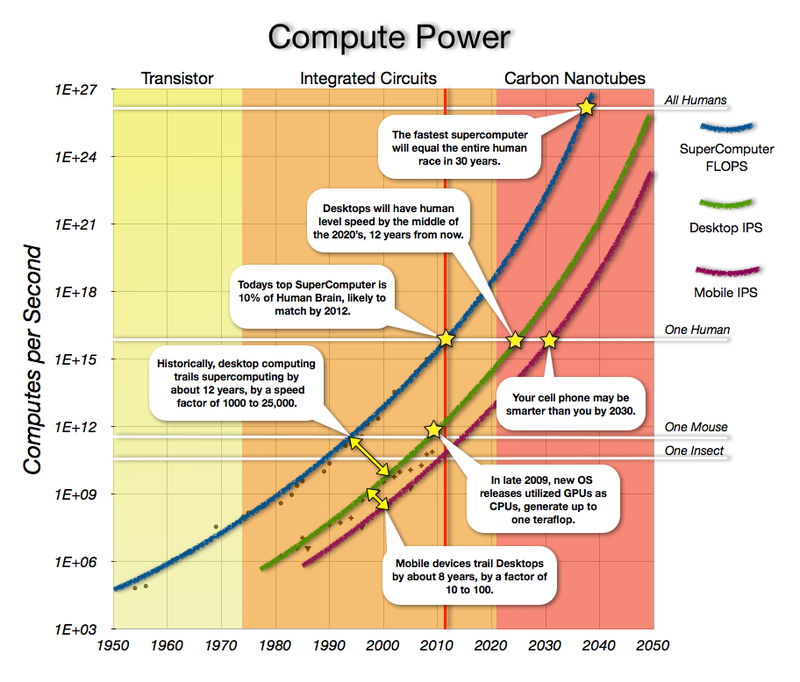 Moore’s Law states that the computer power on a microchip will double every 18-24 months. If you double 10 times, the improvement is over 1000 fold or (2 * 2) repeated 10 times. In this graph you will find three computer trends, super computers, desktops and mobile. Note how they all run in parallel and the rate of improvement is increasing. The implication is that computers will grow by another factor of a million easily. Enabling several key technologies from robotics to artificial intelligence, genetic sequencing to brain scanning. Credit is due to Ray Kurzweil for this type of graph in The Singularity is Near. Highly recommended. Does that mean over 40 years computers have improved in performance by a million? It most certainly does. More so computers have become substantially smaller and cheaper. It is no accident that you had a desktop in the 80’s, Internet in the 90’s, high speed Internet in 2000, smart phones in 2007, and tablets in 2010. Expect next to see wearable technology in the form of glasses and watches.